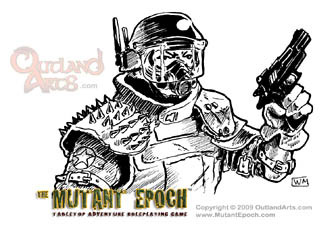 The Mutant Epoch:: A preview of TME post apocalyptic characters. Generating characters is accomplished through a series of 16 steps, some random, some by the players choice, a few steps are quite involved and require several rolls and a bit of explanation while others are very easy, such as when players pick a name and gender for their new character. Most steps require little more than a single roll on a table to determine dominant hand, swimming ability and whatnot, while establishing a character’s ‘type’ is handled by a random roll from a selection appropriate to the gamer’s own RPG experience, or, the Game Master can assign a type or even allow players to pick a character type once they become familiar with the game and setting. 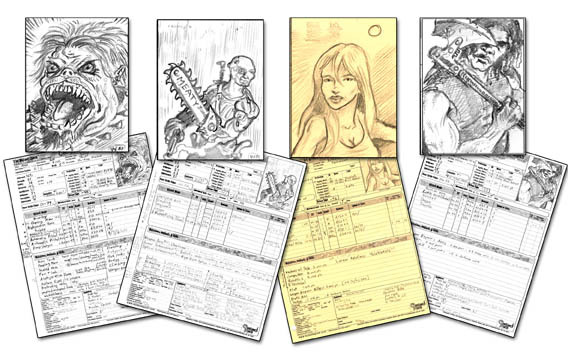 We've added a few sample character sheets from our current campaign. Click to download a 150 dpi PDF character sheet for review. Once the game is launched and available for sale, and the main full web site is up and running, there will be a vast number of ready to play characters and NPCs available for members of the society of excavators. 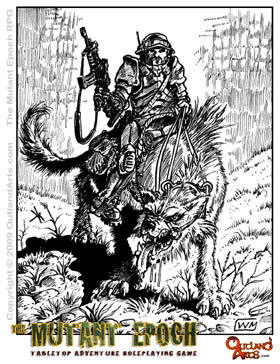 Many other characters types will be offered in Outland Arts’ The Mutant Epoch dedicated electronic magazine titled Excavator Monthly, as well as the upcoming Expansion Rules book, which will add androids, parasites, abominations, grafters, the rebuilt, mutant animals and digital beings as new character types. The actual generation techniques used for character creation vary depending on the type of character being made. Pure stocks, synthetic humans (clones, trans-humans and bioreplicas) are quick to generate while cyborgs and extensively mutated individuals take longer to roll up due to the vast assortment of mutations and implants available through random determination. Regardless of the character type, and including creatures, robotics and many plants, the same eight traits are almost always used for The Mutant Epoch. These traits are most often determined by a d100 roll on a table, which uses a synthetic bell curve to usually get traits in the average range for an adult human, however, allowing for the occasional inferior trait, or, the remarkable and exceptionally high values from time to time. Traits improve slightly during rank gain, but can also be permanently decreased through accidents, illness, combat or other hazards. Endurance is used as the individual character’s toughness, ability to take damage, survive deeper levels of injury and incapacitation, and resist toxins. People change, especially when pressed to their limits, exposed to new experiences, immersed in battle, and forced to use all their skills, strengths, wits and guile in a daily struggle to survive. Many traditional role playing games, including the Outland System have some sort of leveling mechanism. 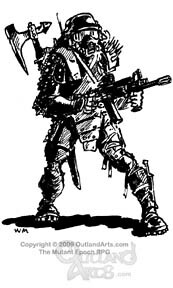 In The Mutant Epoch RPG, going up in rank is helpful, but the alterations to the character are more subtle than other RPGs. For example, when going up in rank, from 1st to 2nd, one’s character doesn’t suddenly double his or her endurance, even though that PC’s endurance trait does automatically increase per rank due to the fact that the surviving individual becomes tougher. Other traits and skills can improve through random results on a bonus table, with each character type rolling with different odds of gaining benefits. Gaining ranks is of course beneficial and desired, but the rules encourage a more realistic, life-like feel than other RPGs. For example, being of 7th rank doesn’t make the character practically invincible, and a well placed bullet or sword blow could still kill a character, especially if a critical strike is rolled. In short, we wanted to avoid the ‘sword and sorcery’ super hero style of gaming which afflicts so many RPGs.